Crazy sock monkies with hair. 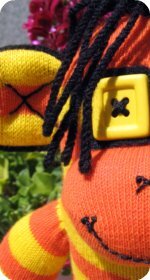 Make a sock monkey that's unique by simply following the basic sock monkey pattern and then adding your own fun craft ideas. Step one: You will need orange striped socks. Follow the basic sock monkey pattern for how to make the sock monkey body, legs, arms, and mouth then continue with the instructions below. Eyes: Cut two pieces of black felt much larger than needed and place behind the button eyes and stitch them to the sock monkeys head with the black embroidery thread. Trim the felt to the same shape as the buttons, leaving them a little larger than the buttons so there is a nice black trim sticking out. Depending on the buttons that are being used I mostly find it easier to trim the felt after it has been stitched on the sock dolls. Ears: Sew black felt between each set of ear pieces first. 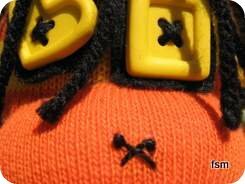 Then stuff, embroider an X with the black embroidery thread and attach to the head. Hair: How to make dread-lock looking hair. Cut some thick black yarn much longer than you need, we'll cut it to the correct length later. 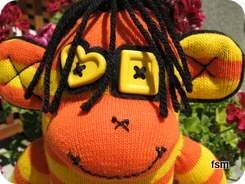 Stitch the yarn to the sock monkies head and secure. When all of the monkey's hair is attached, cut it to the desired length. Nose: I stitched on a nose in the shape of a cross to match the cross stitching that he has in his eyes and his ears. At the top of the crosses are some french knot to represent nostrils. I followed the same theme down to his mouth, he has french knots at both sides of his mouth. The repetition of the crosses and the french knots all with black embriodary thread creates some cohesion and makes him look great. 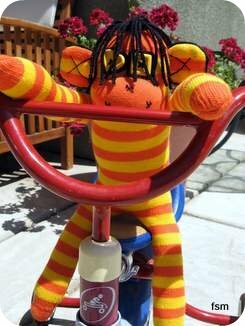 TIP: If you are wanting to learn how to put hair on sock dolls the book "How to make an original red heel sock monkey and other toys" shows you how to do hair in a variety of ways: bangs, braids, straight, crew cut, pony tail, pom-poms and short loop hair.